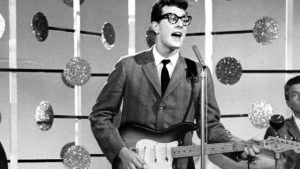 The American singer-songwriter Buddy Holly was a central figure of 1950s rock and roll. He opened for Elvis Presley and became one of the first artists to be inducted into the Rock and Roll Hall of Fame. Sadly his career was called short after his untimely death in a plane crash on February 3rd, 1959, at only 22 years old. Lyrics handwritten by famous musicians, performers, and composers are highly sought after by collectors. Bob Dylan’s original handwritten song lyrics to “Like A Rolling Stone” sold for a record-breaking $2 million. If you are currently in the possession of Buddy Holly handwritten lyrics and wish to consign them, we estimate that his most famous songs would sell for $100,000 each or more at auction. If you have original Buddy Holly handwritten lyrics, which we estimate would sell for $100,000 each or more for his most famous songs, please contact us now for a free appraisal. To auction, buy, consign or sell original, handwritten lyrics please go to http://www.NateDSanders.com, email Nate at Nate@NateDSanders.com or phone (310) 440-2982.